Earlier today, images of Ford’s forthcoming small off-road crossover emerged, giving us a proper good look at the “baby Bronco” for the first time. The new vehicle will allegedly be based on the same underpinnings as the all-new, fourth-generation Ford Focus, making it a comparatively tame, affordable option for the Ford-loyal off-roading enthusiast, as compared to the future body-on-frame 2020 Ford Bronco. 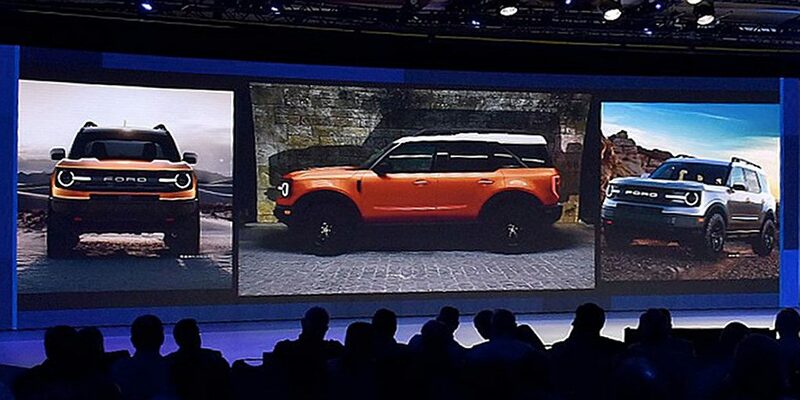 Now, we’ve learned through Bronco6G that the “Bronco” name itself will allegedly become an off-roading sub-brand of Ford Motor Company, which at least partially answers the question: What on Earth will Ford’s small off-road crossover be called? According to Bronco6G‘s sources, the Ranger-based body-on-frame SUV will simply be called “Ford Bronco”. This small, unibody off-roader will also go by “Ford Bronco”, but with an extra moniker at the end. It could be “Bronco Lite”, or “Bronco Flex” (we’re quite fond of that one), or even “Bronco AWD” – a subtle acknowledgment of its lack of a proper transfer case. Or, it could be called something else entirely, so long as it starts with the words “Ford” and “Bronco”. Bronco6G says that the body-on-frame Ford Bronco – the real, full-fat off-road SUV based on the 2019 Ranger platform – will come out within a couple of months of the smaller Focus-based crossover. The full-fat Bronco’s purpose, according to that site, will be to draw people into the showroom; the reduced-fat unibody Bronco, meanwhile, will be the more attainable, everyday version that will suit a wider majority of customers. There are still plenty of unknowns with regard to the Ford Bronco story, of course. Will there be additional Bronco models beside this compact crossover, which will reportedly be comparable in size to the Jeep Renegade? What sort of powertrain options will the so-called “baby Bronco” offer from the factory? And most crucially, will Ford’s gamble on an all-new sub-brand pay off, allowing the automaker to siphon some amount of business from FCA’s iconic “Jeep” brand? Stay tuned to Ford Authority as we uncover more of this story. Not a fan of this idea. If people are already calling it an FJ Cuiser copy, you got a problem. FJ was always seen as a “Wrangler wannabe”. People are expecting a big reveal for “New Bronco” but the message is now all confused with “Baby Bronco” & “maybe Bronco will be its own brand”. Ugh … just hit the mark by coming out with a great (not overpriced) new BRONCO. Stop diluting what could be a great win for Ford. Bronco should be targeting Wrangler & not step all over Raptor. After seeing this new messaging, it seems Ford’s gonna drop the ball and try to overdo the Bronco name with a cheap commuter Focus based Baby B. Nobody asked for a half-arsed “baby” Bronco “Flex”? (Flex is one of those generic Ford “F” names that says “blah…”). A “Bronco” should be a stretch to attain (but not too much). Come on Ford, you have a tiger by the tail… if the whole company jumps on its back for a ride, it won’t go very far. They haven’t tried this since the Edsel…. and for good reason. Just introduce the vehicle and stop over-thinking it. I suppose one could say they tried this same thing with the Lincoln brand not too long ago. No clue what they gained from that move either. Except for the Navigator, Lincoln sales are all in the tank currently.